Just to let you know the next game will be going up on Monday. So be sure to vote if you haven't already. You really should just go with Moonwalker, Darran. Streets of Rage 2 is a great game, but has everyone not played it about 14 million times already? Smurph wrote: You really should just go with Moonwalker, Darran. Streets of Rage 2 is a great game, but has everyone not played it about 14 million times already? I wouldn't mind SOR2 so much if it weren't for the fact that I (and probably many others) already replayed it on the Ultimate Mega Drive Collection thingy on PS3 a couple of months ago. To be fair, I've also replayed Moonwalker two times this year, including once since MJ's death, but I could listen to that music for at least 150 more playthroughs. Right then. Based on feedback both in this thread and elsewhere on the forum I'm going to do two things. Moonwalker will be the next game we play. A new poll will be done, to ensure that featured games are popular, but not ones that have featured quite heavily in the magazine. I appreciate that this will no doubt annoy some, but I want to try and create something that as many people as possible will join in with. While Streets of Rage 2 would have been cool (because it's accessible to so many gamers thanks to recent compilations) it's going to feel like covering the same ground. I'll set up the next lot of threads in the next day or two. Its got to be Metal Slug3,i know its not the best one by a long way,but the artwork is cool and would look real prety in the mag! Darran@Retro Gamer wrote: Moonwalker will be the next game we play. Won't catch me trying to get that one on ebay at the moment! i did offer to lend it. the offers still there! ive played it to completeion many times so i dont mind playing through via emulation this time around. I voted for California Games. Streets of Rage 2 is too obvious, Rainbow Island & Pilotwings are good but were never my favourites, and MS3 is gash. Streets of rage was a great game, but I had already played other similarly themed games. 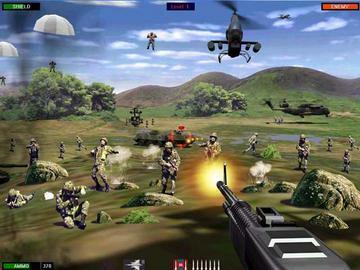 Beach Head felt innovative and was a game you would continue to play even after finishing it. yes lost a few days/weeks/months as a child to that one..... I felt though Beach Head 2 was missing that same somthing.... did you know there was a Beach Head 2002 ? hmm from those screens it seems more an Operation Wolf clone than that of our Dear Beachy Head! Ah, that's right...I had completely forgotten about the 2002-release of beach head. Is it any good? Has to be cal games............. i remeber playing it for hours on sms. and once getting 9.5 on surfing!!!!!!!!! never been able to do it again. So when does polling start for issue 68? ']['enacious wrote: So when does polling start for issue 68? 68 is already in the shops!